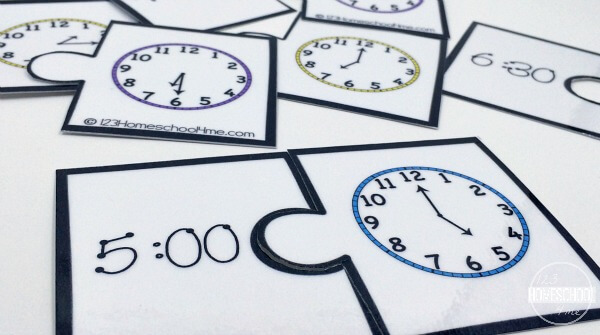 Give kids the practice they need telling time with these fun, free printable telling time puzzles for kindergarten, 1st grade, 2nd grade, and 3rd grade students. 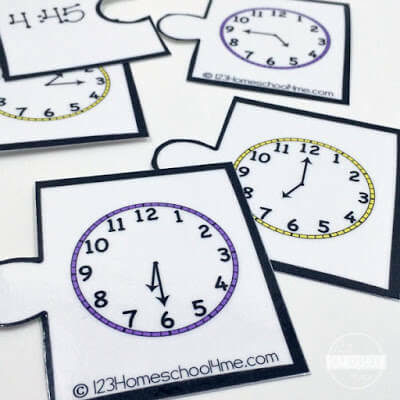 One of the most important math skills kids learn in the elementary years is telling time. They need to learn not only how to tell time, but also how to solve more advanced problems involving time. It often seems, however, that my daughter needs a lot of practice and review. 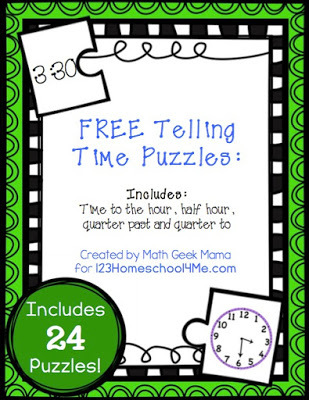 To help her, I created these fun telling time puzzles and I’m excited to share them with you! 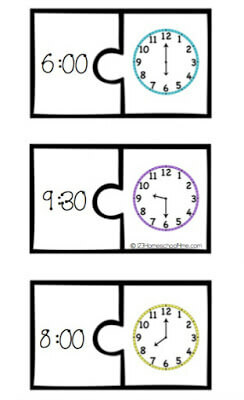 I have already spent time explaining how a clock works, and teaching the difference between the hour and the minutes. We’ve also read this telling time story book. Unfortunately, whenever I give her review problems or ask her to tell me the time, I feel like I have to reteach it! She struggles to remember which hand is which, and how to figure out the minutes. We’ve used puzzles before to work on important concepts, and it always makes practice so much more fun! She enjoys practicing with these, and I like that it’s an activity that she can work on independently. Once she’s finished matching the puzzle pieces, I can check to see if she matched them correctly. Having to find matching pieces also helps her self check because if she mixes up the hour or the minutes and doesn’t see that answer as an option, she knows she’s done something wrong. I would encourage your kids to sometimes look at the analog clocks and find the appropriate match, and other times to use the digital display and find the matching clock. That way they get used to telling time both ways. 12 show 15 minutes past and 15 minutes to the hour. Simply print whichever puzzles you would like to use (I suggest using a laminator for durability) and then cut out the puzzle pieces. Then you can give them to your kids to put together! 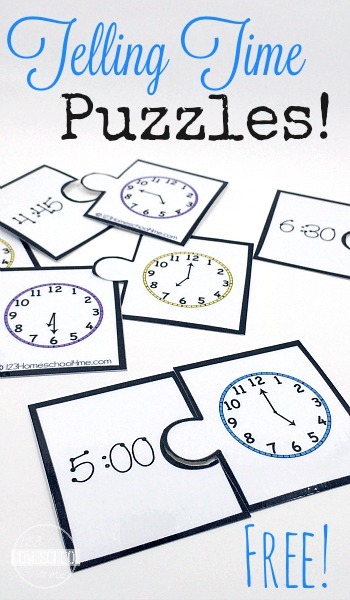 I hope you find these puzzles to be a fun and simple way for kids to practice telling time! And if you need more practice, try this fun Spring-themed set of time practice pages! I love this idea! But can’t seem to find the link to download. Can you please help me out? Thank you! Hi Edie! Sorry, looks like the download box disappeared! No worries, I got it all back and ready for you to download. Enjoy! It looks like there was a glitch and it wasn’t showing properly. Sorry about that – it is all fixed – enjoy! LOVE the puzzles idea for my students with autism. Can not figure how to agree to your terms in order to download the telling times puzzles. I am especially interested in the quarter hour puzzle pieces.